is a cognitive scientist in the Department of Psychology at the University of Chicago. His work has appeared in The Conversation and Nautilus, among others. For centuries, Inuit hunters navigated the Arctic by consulting wind, snow and sky. Now they use GPS. Speakers of the aboriginal language Gurindji, in northern Australia, used to command 28 variants of each cardinal direction. Children there now use the four basic terms, and they don’t use them very well. In the arid heights of the Andes, the Aymara developed an unusual way of understanding time, imagining the past as in front of them, and the future at their backs. But for the youngest generation of Aymara speakers – increasingly influenced by Spanish – the future lies ahead. These are not just isolated changes. 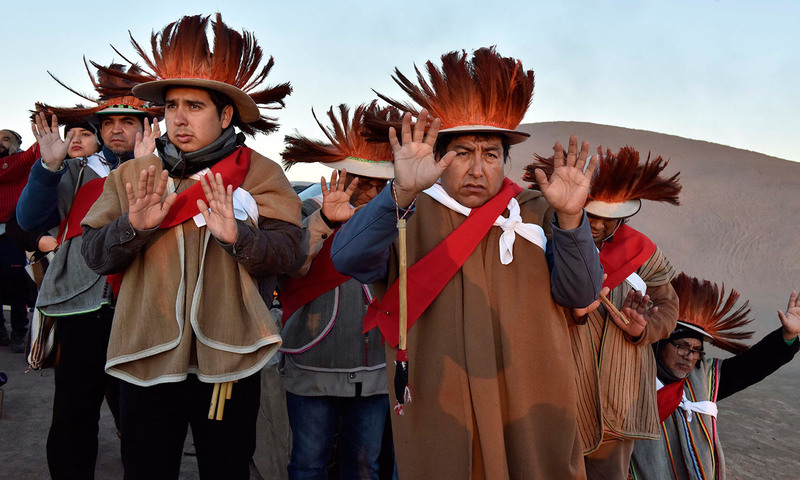 On all continents, even in the world’s remotest regions, indigenous people are swapping their distinctive ways of parsing the world for Western, globalised ones. As a result, human cognitive diversity is dwindling – and, sadly, those of us who study the mind had only just begun to appreciate it. In 2010, a paper titled ‘The Weirdest People in the World?’ gave the field of cognitive science a seismic shock. Its authors, led by the psychologist Joe Henrich at the University of British Columbia, made two fundamental points. The first was that researchers in the behavioural sciences had almost exclusively focused on a small sliver of humanity: people from Western, educated, industrialised, rich, democratic societies. The second was that this sliver is not representative of the larger whole, but that people in London, Buenos Aires and Seattle were, in an acronym, WEIRD. But there is a third fundamental point, and it was the psychologist Paul Rozin at the University of Pennsylvania who made it. In his commentary on the 2010 article, Rozin noted that this same WEIRD slice of humanity was ‘a harbinger of the future of the world’. He had seen this trend in his own research. Where he found cross-cultural differences, they were more pronounced in older generations. The world’s young people, in other words, are converging. The signs are unmistakable: the age of global WEIRDing is upon us. This marks a major change of course for our species. For tens of thousands of years, as we fanned out across the globe, we adapted to radically different niches, and created new types of societies; in the process, we developed new practices, frameworks, technologies and conceptual systems. But then, some time in the past few centuries, we reached an inflection point. A peculiar cognitive toolkit that had been consolidated in the industrialising West began to gain global traction. Other tools were abandoned. Diversity started to ebb. The WEIRD toolkit comprises our most basic frameworks for understanding the world. It touches on every aspect of experience: how we relate to space and time, to nature, to each other; how we filter our experiences and allocate our attention. Many of these mental frameworks are so ingrained we don’t notice them. They are like the glasses we’ve forgotten we’re wearing. Consider our obsession with numbers. In global, industrialised cultures we take it for granted that we can – and should – quantify every aspect of experience. We count steps and calories, track interest rates and follower counts. Meanwhile, people in some small-scale societies don’t bother to track how old they are. Some couldn’t because their languages don’t have numbers beyond four or five. But WEIRD quantiphilia is quickly catching on. Hunter-gatherers in the Amazon are now eagerly learning Portuguese number words. In Papua New Guinea, once home to a rich variety of ‘body count’ systems – numbered landmarks on body, usually ranging to about 30 – children are learning English numbers instead. Another peculiar part of the WEIRD toolkit is our fixation on time. We budget it, struggle to save it, agonise over losing it. We count days, hours and seconds. We are always oriented to exactly where we are on the long arrow of history. In the United States, for example, when doctors screen patients for cognitive impairment, one of the first questions they ask is the year, month and date. To many in non-Western, non-industrialised groups, this fixation might seem odd. One early 20th-century ethnographer, Alfred Irving Hallowell, observed that the Ojibwe of native North America would be unruffled by not knowing whether it was a Thursday or Saturday. What would distress them, he remarked in 1957, is not knowing whether they were facing south or east. Not so for WEIRD people: our fixation on time appears to be balanced by a breathtaking obliviousness to space. A 2010 study found that Stanford students could not reliably point to North. Now, such obliviousness to space is going global. Satellite-based navigation systems are displacing traditional techniques worldwide. It’s happening in the Arctic, as we have seen, but also in the Pacific. In Micronesia, seafaring was once accomplished with jawdropping precision by using a conceptual system so different from Western ones that scientists struggled to understand it. Today, this masterwork lives largely in museum exhibits. Everyday ways of talking about space are undergoing a sea change, too. Very often, people in small-scale communities prefer to describe space using cardinal directions or local landmarks – often slopes, rivers or salient winds. Some of these systems, like the Gurindji compass terms, are highly elaborated. In contrast, WEIRD folks prefer to carve up the world in terms of their own bodily axes – their lefts and rights, fronts and backs. This ego-based frame of reference now appears to be taking hold broadly, spreading along with the influence of global languages such as Spanish. Humanity is getting more ego-centred in other ways, too. It has long been observed that Western adults – and Americans in particular – privilege the individual over the group. We give our children unique names; we put them in bedrooms of their own; we emphasise their autonomy and needs. People in many other societies, most famously in East Asia, have historically privileged the collective instead. But Western-style individualism is gaining a foothold, even in the East. Japanese people have started giving their children unique names, too. A recent analysis of 78 countries found that, over the past half-century, markers of individualism have increased in the majority of them. These are just some of the frameworks that are being displaced as global WEIRDing accelerates. Elsewhere, taxonomies, metaphors and mnemonics are evaporating. Many were never really documented in the first place. Researchers still don’t fully understand the conceptual system motivating khipus – the intricate string recording devices once made by the Inkas – but there’s no one left to explain it. Human cognitive diversity joins a number of other forms of diversity that are disappearing. Diversity of mammals and plants, of languages and cuisines. But the loss of cognitive diversity raises issues all its own. Cognition is invisible and intangible, making it harder to track and harder to record. You can’t pin mindsets to a specimen board, or store them in a seed vault. It’s not easy to pose ways of knowing in a diorama. Thinking leaves footprints, of course – in language, in artifacts, in knotted string – but the act itself is ephemeral. The loss of cognitive diversity raises an ethical dilemma, too. The forces that are eroding cognitive diversity – the forces of global WEIRDing – are often the same forces that are raising literacy levels worldwide, promoting access to education and opportunity in indigenous communities, and connecting people across the globe. Few would deny that these are positive developments for humanity. So we are left to ask, not only whether we can slow the loss of human cognitive diversity, but also whether we should even try. Cognitive scientists such as myself are not used to grappling with these kinds of questions. Nor are we used to thinking about big trends in the human journey. But global WEIRDing is a trend we can’t ignore, one with scientific, humanistic and ethical implications. For much of human history, one of our most distinctive traits as a species has been our sheer diversity. But then our course began to change – and it’s time that cognitive scientists joined the conversation about where we’re going.